If you’ll excuse my bluntness, I’d like to send the Catholic hierarchy a quick and pointed message: Please be quiet. I’m referring, of course, to the explosive and ongoing battle that’s erupted over whether or not faith-based institutions – such as universities, charities and hospitals – should be required to make contraceptives available to their employees for free as part of their employer health-care plans. In a year when a presidential election was supposed to be all about jobs, it’s somehow — as Anne Taylor Fleming noted recently in Politico — ended up being about the female body instead. On Friday, after several days of severe criticism from the Catholic Church, Republican congressional leaders, all four Republican candidates for president and even some liberals, President Obama released a compromise measure that would shift the requirement to provide free, preventative birth control to the insurers of such institutions. 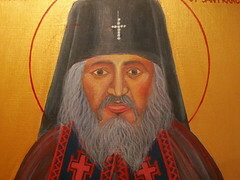 Image: Icon: St. John Maximovitch, Archbishop of San Francisco by rosefirerising via Flickr under a Creative Commons license. This just in, from the Department of “Can you imagine this happening in the United States?” Two prominent atheists – popular philosopher Alain de Botton and popular science author Richard Dawkins – are sparring over the wisdom of erecting a “temple for atheists” in London. In his latest book, Religion For Atheists, De Botton argues that even atheists have a soft-spot for the sort of grandiose architecture commonly associated with churches, mosques and temples. He has thus raised some 500,000 British pounds (approximately $786,000) to construct what he refers to as a “secular space for contemplation” in the heart of the city’s financial district. Although many in the West have little time for organized religion, they still have feel nostalgic for its “consoling, subtle or just charming rituals,” as he put it in an interview with a columnist at The Daily Telegraph. In part, de Botton is motivated by a desire to counter what he sees as the “destructive beliefs” about atheism put forward by scholars like Richard Dawkins and the late journalist Christopher Hitchens, whom he sees as criticizing religion without offering anything more inspirational in its place. De Botton wants, instead, to borrow the idea of awe-inspiring buildings that give people a better sense of perspective on life. 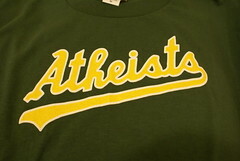 Image: Atheists by yoshinari via Flickr under a Creative Commons license. The actors are to die for. The series launched Jeremy Irons’ career and also features outstanding performances by Diana Quick, Anthony Andrews, Lawrence Olivier and more. Plus, any film that dwells on extensive bouts of family conflict, alcoholism and unspoken homo-eroticism? I’m there. So that was all well and good. But as the series wore on, it became increasingly clear that this wasn’t just another voyeuristic journey into the heart of Oxbridge-bred England. Rather, it was essentially a protracted tale of one family’s inexorable, inter-generational and self-destructive struggle with Catholicism. I’ve written before about my own personal struggles with my family’s faith. How my husband and I have tried, through the years, to reconcile my religious Catholic upbringing with his cultural Jewish identity. And how that has led me to become, begrudgingly, over time, a sort of reluctant secularist. 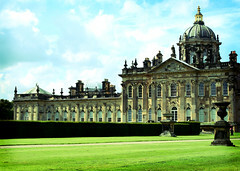 What Brideshead Revisited added to that equation was the pain and guilt that goes along with that decision. I wanted desperately, as I watched, to identify with Charles Ryder, the protagonist of the story. He is the stoic, eternally rational hero who can’t quite fathom why this otherwise well-educated and cultured family in which he has become enmeshed – The Flytes – is so hopelessly caught up in their Roman Catholic faith. Instead, I ended up identifying with Julia, his beloved, who tries her very best to leave her religion (and thus, to some extent, her family) by embracing Charles (and divorce and modernity) and the skepticism it implies. In the end, however, it’s too much for her and she can’t quite bring herself to do it. It breaks her heart, but she chooses the Church over her true love. It is her destiny. I won’t do that. I left the church long ago and save a few masses here and there and the occasional compunction to pray on airplanes, I don’t think I’ll ever go back to Catholicism. Or any other religion, for that matter. Even Judaism. But I experience that as a loss. And it’s a painful one. And that’s why I envy all the atheists I know, who make up about 90% of the people around me, including my husband. They don’t share this anguish. It doesn’t keep them awake at night. I would love to have that peace of mind. And that, my friends, is one price of adulthood. At least mine. Image: IMG_2994 by Franie Frou Frou via Flickr under a Creative Commons License. Sometimes the easiest questions are the hardest ones to answer. Like: What religion are you? I had reason to think about this issue the other day during a routine doctor’s appointment at a local London hospital. As we were winding up, the doctor turned to me and asked: “Oh, yes, and what religion are you? It could be relevant to your treatment.” He was holding a clipboard and a pen, ready to tick the appropriate box on his chart. OK. Here’s my guilty summer confession: I can’t get enough of the Mel Gibson scandal. Let me preface this post by saying that I’m hardly one for celebrity gossip. I have no idea who Justin Bieber is. I don’t care whether Jennifer Aniston wants kids or not. And despite former Politics Daily colleague Emily Miller’s compelling argument for why we should all be taking The National Enquirer more seriously, I can’t stomach tabloids. Still, when it comes to the ongoing Mel Gibson saga, I can’t look away. And I suspect I’m not alone. And that’s because — Australian accent notwithstanding — Gibson embodies a whole bunch of different ills plaguing America right now, which we’re trying, as a nation, to figure out. And as we do that, Gibson provides a convenient foil for examining our worst fears about ourselves as a country. While you’re there, you may also wish to check out my post on the growing trans-Atlantic tension over the BP-Lockerbie hearings this Thursday in the United States Senate. 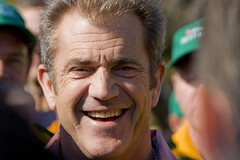 Image: Mel Gibson by kjd via Flickr under a Creative Commons License. Passover begins tonight, followed quickly by Easter. 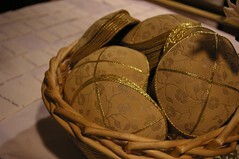 As a former Catholic married to a Jew, I hate this time of year. It reminds me — once again — of just how unresolved my husband and I are about the status of religion within our family. Yesterday, I was over on PoliticsDaily.com talking about how hard this time of year is for those of us in inter-faith marriages. 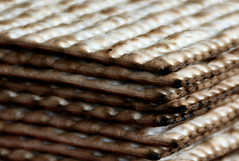 Image: Passover by Ohad* via Flickr under a Creative Commons License. For those of you who live in Europe – and even those who don’t – you’ll know that headscarves – and now burqas – have been a hot-button political issue in France for awhile now. Today, a colleague of mine over on PoliticsDaily.com – Bonnie Erbé – wrote a post suggesting why she thinks France should go ahead and ban the burqa…and why The United States should do the same thing. As with so many issues, my feelings on burqas and headscarves have changed dramatically since living in a country where they are a part of everyday life. 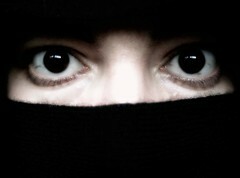 Please come visit me over on PoliticsDaily.com today where I find myself in the unexpected position of…defending the burqa. Image: Burqa a Meta by fotorita via Flickr under a Creative Commons license.